How To Overcome Challenges Of Managing Multiple Warehouses? If you’re a bestselling brand selling thousands of products every day on multiple eCommerce stores, then one warehouse won’t suffice. Even if your single warehouse in the middle of America has the capability to meet every spikes in demand; you are losing your customers owing to high shipping costs and shipping delays. Why Keeping Multiple Warehouses is a Better Business Decision? Suppose you’re a leading distributor of Adidas shoes in the mainland USA. Adidas has asked you to secure space for a warehouse and start selling on leading eCommerce stores. Which location would you choose? If you choose Kansas because of its central location, you will delay shipments to population concentrations in the west and east coast. If you move the warehouse to New York, you’re delaying shipments while adding shipment costs to your customers in Miami; Los Angeles everywhere other than the east coast. Because of these logistics challenges; popular brands insist on multiple, compact warehouses in every major cities rather than a single huge warehouse. While multiple warehouses address those problems, they bring new challenges of their own. With a single warehouse, it’s easier to keep an exact count of your entire inventory and simplify supply chain. 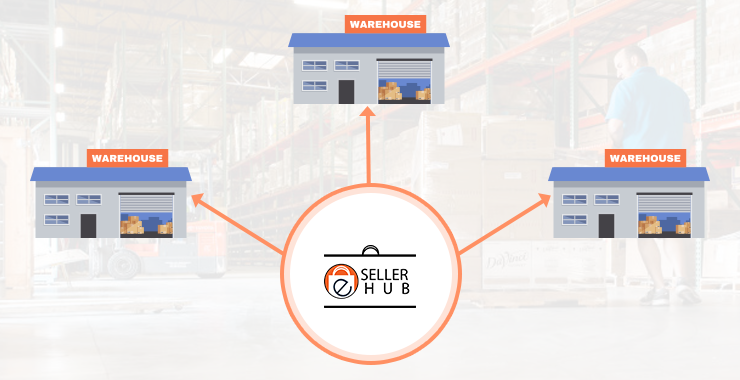 However, when you’re running many warehouses, you have to track available inventory in each warehouse; decide which warehouse will ship a product upon customer’s order, which warehouse will store bulk of the order for a product category, etc. In a nutshell, managing a network of warehouses isn’t a work of a small team, logging data on sheets. It needs continuous collaboration of various teams in multiple locations, working on a robust inventory management system. Inventory management systems have a market to themselves. Each comes in different size and color and not all of them support multiple warehouses. Only inventory management systems from major vendors support multiple warehouses and they come with steep licensing fees or are sold as a service with monthly fees. At eSellerHub, we develop custom software solutions according to your business requirements. We work around your business, talk to your operators and supervisors, go through your business process, and develop a custom inventory management system to address the problems, raise the productivity of the employees and efficiency of the process. At the end of the project development, we transfer the project source code to you. You are free to deploy the code wherever you want, license it, or offer it as SaaS. 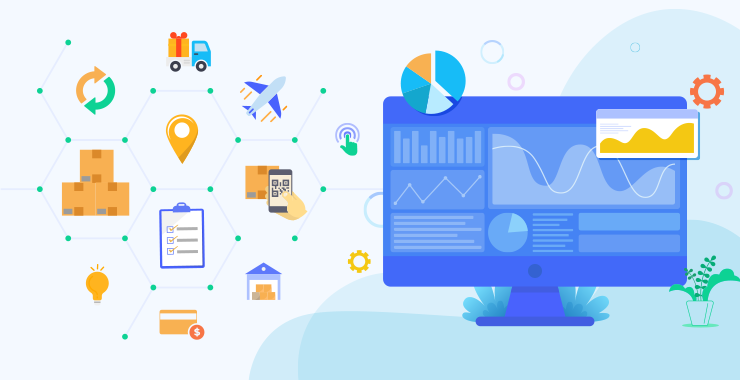 When working with a client who wants to manage more than one warehouses with a single solution; we consider a few things when developing a custom inventory management system for them. When you have more than a single warehouse to manage, you have to ensure that all the products are in inventory, which can be a challenge. Inventory and sales number can run out of synchronization. When you have multiple warehouses to manage, it’s simpler for the people part of your supply chain to be ignorant of what is going on in other warehouses; which leads to low stock numbers before you realize. Understocked products lead to supply chain disorganizations and loss of monetary and customers’ value. Our inventory management system cut the chaos around running into problems with your warehouses by giving a centralized location to view and monitor all warehouses. Any admin can access the location from a web interface. Inventory management system developed by us, makes it easier for you to predict future demand curves by analyzing previous and current data. The system presents the most detailed analysis of demand projections. You can learn about the future demand of every product you sell and in which regions the demand will peak for a product. If our software tells you that the demand of iPads and Chromebook will peak during back-to-school period in Calif and Florida respectively; you know which warehouses need to be stocked with iPad and which with Chromebook. When you are running multiple warehouses across the country, some warehouses tend to perform better than the others do. Our inventory management system will simplify the economics around gathering performance-to-price ratio of each warehouse. The system will generate reports so that you can learn which warehouses need attention. You can go through the reports to understand what is preventing those warehouses from taking off. You work to solve those problems and improve revenue flow. No matter how efficient the system is at predicting demand spikes, they can’t provision the supplies unless the fulfillment workflows can scale to spikes. Our inventory management system has an ingenious approach to building fulfillment workflow at all your warehouses. We run for efficiency when the demand curve is flat but move to an on-demand model as soon as there is a demand spike. As warehouses tend at a distance from each other; it’s intolerable to have personnel who operate those warehouses packed in a single office. With remote operator managing warehouses, companies managing them often run into collaboration issues. Lost or unclear messages can cause blunders or bottlenecks. A lack of head-on collaborations can limit natural discussions around reorganization or refining processes. We make sure the system developed for you has integrated tool of communication and real-time collaboration to mitigate issues around miscommunications. The cost of procurement of an inventory management system is only a fraction of what you can lose if the software system isn’t built around your business requirements. If the system is adding complications to the business process rather than addressing them and making your operators to adapt to it not the other way around; then you’re not getting any return for your investment if you at all consider the amount you paid to buy the software solution as an investment. This is the actual cost that most warehouse managers tend to overlook and are more concerned about cheapest options in the market or those running attractive marketing campaigns.